I have a love-hate with technology. Technology can be democratizing. Technology can be disruptive. Technology can make millionaires out of mooches. Technology can create a perpetual cycle of flux and learning wherein you can never know enough. I just want technology to get to the point where it ideally makes my life better and then that’s good enough. Can I post a status update to long forgotten friends? Swell. Will Facebook infer what I’m doing and synthesize a report of what I’m doing for all to see? It’s not impossible-- it’s just a matter of time and that’s an example of technology going too far. Getting in early on a technology is sometimes the key to dominating it. Elvis wasn’t the first musician or even the first rock’n’roll singer-- he was just early enough to enter an uncrowded space and make the most it. Bill Gates saw the Altair and knew it needed to an operating system. Steve Jobs saw all of the technology and talent that was ready to pop and capitalized on it. If you get in a little too early, you’re building it all. If you get too late, you’re in a crowded community pool. For several years, I have been watching 3D printing. Call it rapid prototyping. Call it additive manufacturing. It’s about making real things with a contraption tied to a computer. It’s about one-off manufacturing. It’s about making something so elaborate and unique that the process of production would be prohibitive through regular means. We get our information digitally. I get most of my income digitally having never met some of my clients in person. Our games come digital. Our movies are digital. We shop local to a practical extent. We have some of our backyard converted into garden space and a DIY greenhouse in our front yard. Water falls from the sky, but we’re not organized enough to collect a great deal of it (yet). We could rig up wind and solar to zero out some of our electricity and heating costs. Manufactured goods remain as something we still have to buy from a merchant. If we can crack the nut of how to make our own gadgets, tools and creature comforts, we would be able to have an abundant life for very little money. I think 3D printing is way to accomplish that. When I say that 3D printing can replace a lot of manufacturing, people get out their pitchforks, especially people big on 3D printing. They all believe this will be a hobby and a curiosity. If 3D printing remained in the realm of the hobbyist, I would consider it a failure. In the 1970s and 1980s, people seriously misjudged the impact of computing. Before the PC, many thought that the common folk had no use for computers. Before the Internet caught on, many people thought it was a way to communicate from university to university (largely to answer the question of “Who’s better: Kirk or Picard.”). Few thought that a camera would be a fixture on a phone. Few thought people would be hyper-connected. I think 3D printing could take a generation to catch on, but I think its impact is going to take some time and it’s going to be massive. When the Printrbot Simple came on the market, I jumped at the chance to get one. I got into 3D printing even though I felt that 3D printing was still in the realm of the Altair computer-- a machine from the mid-1970s with 8K of RAM. Tablets usually sport more than one-million times the memory than the poor old Altair. Altairs arrived a kit that you had to assemble. The Altair didn’t have a keyboard, it didn’t have a hard drive, it didn’t have a monitor nor speakers. When turned it on, it’s commanded were input by flipping arcane switches. It was a runaway success. 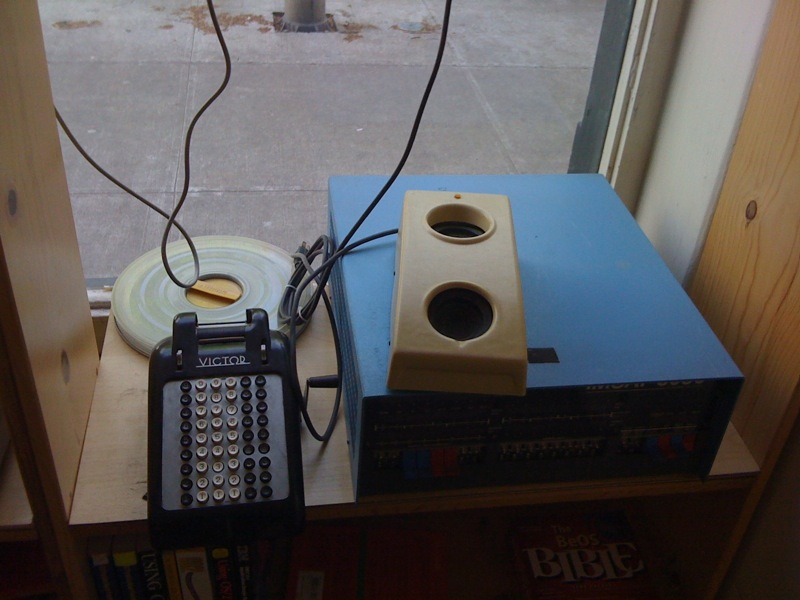 As my friend, Bill, and I were assembling the Printrbot, I was reminded of that old blue box from forty years ago. The printer arrived boxed up and ready for assembly, its contents were a combination of high-tech, low-tech and hokum. The circuit board is an arduino board, bristling with opportunity. It has four precision motors and an extrusion head that heats plastic filament to 200 degrees celsius. The parts get mounted onto wooden boards that come pre-cut to be assembled into the chassis. The hokum: three of the motors use dremel sanding tubes to create a traction surface. The traction surface pulls lengths of string. As a long time dremel aficionado, I enjoy how those sanding tube break down excess material. Unfortunately, they also make short work of the string. 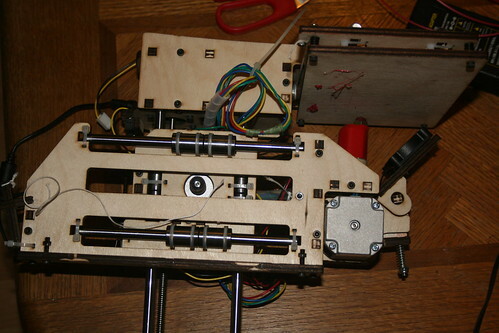 When the string goes, the printer has to be partially disassembled to replace the string. When I saw the string, I thought, “Really?” When I finally got the printer going (see much below), I had to nurse the strings, actually making guards out of duct tape so that the printer action was not perpetually and literally derailed. After we put the printer together, I had to figure out how it worked. 3D printers print computer generated 3D shapes. Those are commonly stored as “STL” files. Those can be found at places like Thingiverse (http://www.thingiverse.com/). These are abstract shapes that can be scaled and altered to suit. One of the programs that passes the print job to the printer is called Repetier (http://www.repetier.com/download/). To make the shapes into some printable, Repetier will use a slicing program to turn the shape a series of instructions. These instructions are called “G-Code commands.” Each G-code string is one discreet command sent to the printer to act (eg. “M80” turns on the printer; and “M81” turns it off again). These commands are sent in series for action. The printer will move the head left, right, back, forwards, up and down. It will push out melted plastic filament of even back that off a bit to lessen the flow or material. At least, that’s the theory. After I was done with the assembly, the installation and the introduction of an STL shape, I tried to print something. This where things get rocky, so let’s run point form. You upload the shape, and run Slic3r (inside of the Repetier) to get the G-code commands. For some reason, when Repetier has a problem, it will forget a lot. It will look the G-code commands. As soon as you have the chance: save the G-code to disk so you can recall it after it’s lost. The whole shebang will not run until you connect (the big obvious icon to the left), and the switch it “on” under the manual action. Try as I might, nothing would work until I did this extra step. From the same manual controls, you can turn on the fan and adjust it’s speed, you can also turn on the extrusion heater. Until you get the extrusion heater to above 190 degrees celsius, the extruder will not try to feed the plastic filament. Getting the filament into get sucked in by the printer was really hard. Try as I might, I discovered what was up: the Printrbot Simple has the extrude and retract commands mixed up. Extrude pulls out the filament. Retract pushes it into the melter. When I tried to feed it in, it was getting repelled, when i went in reverse, it fed it in. That’s one of mysteries. The motors for the three axis need to be calibrated so that the printer knowledge where it’s elements are. There are commands to get the printer to go as far as possible to establish its positions. Doing this can rock the tiny printer. On a few occasions, the homing process caused the strings to unravel. Several times, it couldn’t work out the bottom of the Z-axis. That just slammed the extruder into the print bed. Undaunted by the problems, I set a print job going. The klutzy lack of extrusion didn’t stop the printer from trying to work. What did kill it was that one of the string snapped. I hate those strings. So, in the hacker spirit, I stopped for today with vow to hack my Printrbot Simple to make it actually work-- more on that when I do my next installment.